dance that compiles so much software. If the software doesn't compile for you first try be sure to check the README file and the configure script output - odds are you are simply missing a build dependency. If you can't figure out the issue on your own pastebin the error message and post it in the comments - I'll do my best to lend a hand. There are a few different ways to get an image of a TI-ROM. You can dump the ROM off of a physical calculator you own (mildly complicated, check that README file for details on this) or you can hit Google. I found a good TI83 download here. WOW those calculators look totally boss! We don't have anything like that in Ireland. That's older than 10 years. I was using one in high school and that was 16 years ago. That is pretty awesome though. Thanks! Is there any reason you don't use 'tiemu' which is available as a binary package in the Debian and Ubuntu repos? Is it b/c tiemu only emulates TI89 and 92? We had to: sudo apt-get install libgtk2.0-dev (per http://ubuntuforums.org/showthread.php?t=1687776 ) to be able to ./configure successfully. I have been chomping away at khanacademy.org to sharpin my skills I left behind some umpteen years ago. 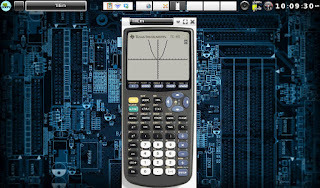 As I plan to get into the high level math and see the recommendations for calculators (mostly the 83/84 plus) I have been researching ti's site and read about the newer Nspire. Now I am overwhelmed with options and restrictions. I keep thinking I don't need to drop nearly $200 on a calculator when my T101MT is just fine but if i do spend so much on a calc what is the smarter choice? Some promote a 84 plus keypad but if it does the same thing (or more) just keyed differently how do i know or will restrictions on future exams bite me in the end? Regardless, are there any tips from the pros about this investment? Honestly it depends on the school for which calculator you get. I've been using an nSpire with my studies for the last three years now and it works great - all my classes have allowed it's usage. configure: error: Library requirements (gtk+-2.0 >= 2.4.0) not met; consider adjusting the PKG_CONFIG_PATH environment variable if your libraries are in a nonstandard prefix so pkg-config can find them. Sounds like Fedora 16 is putting build deps in non-standard places. I'd suggest posting your above error on the Fedora help forums. yum install tilem worked beautifully. moved the rom files as you instructed and all is well. Might be users that are forgetful as I am! You have to go into your home folder and click under view to display hidden files. From there you find the Tilem folder and put the rom image in the proper folder as there are a few different folders for each. Once you have the rom image in all you need to do is type Tilem in your terminal and it comes up easy! Grew up near Chicago myself in Bridgeview. Not as swift as you as am only pursuing Associates in BIT. Thanks for not posting previous as I felt very foolish. Would appreciate if this was posted as to help those that get confused as I do sometimes! Glad you got it working - I didn't see another post from your name, perhaps blogger auto-sorted it to spam by mistake. Guess I should go manually sort through those comments. It also works to compile tilem2 in Rasbian on Raspberry Pi.